I love this! So many details and the colours are spectacular. You have a great view! By the way, did you use a tripod? The colors are so unusual, they draw one into the shot for a closer look. A lovely scene! Wonderful! 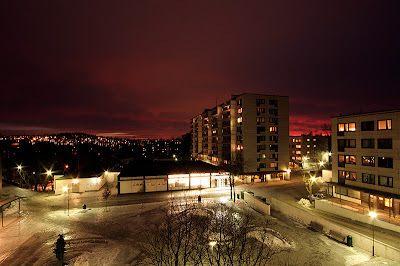 Love the red sky and all the lights. Lovely view! The sky color is rather unique to weird but cool! You have a great view and the nighttime wintry landscape is quite beautiful. from a Norwegian in Minnesota who visited Oslo once.